Our intuitive ordering system is specifically designed for the precise needs of wholesale and B2B customers, allowing them to create orders quickly and with ease. Increase order frequency and value by making the ordering process simple and enjoyable for your customers. Allow your customers to log in and order from you at any time. Customise your website to match your branding. Focus on growing your business, not on spreadsheets, paperwork and admin. Our admin tools are specifically designed for B2B order processing, streamlining your entire operation. Manage your products and customers and automate the ordering process from start to finish, freeing up valuable time and putting an end to costly mistakes. Manage orders, invoicing and fulfilment. Invite your customers and manage their details all in one place. Efficiently add products with multiple variants (colour, size etc). 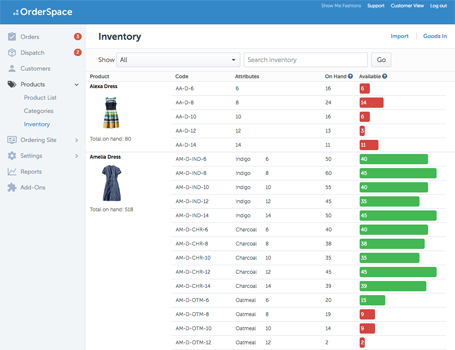 Keep track of stock levels and decide how much stock information to provide to your customers. Add product collections and control who gets to see them. 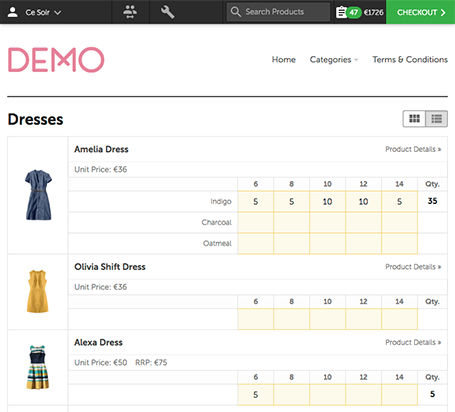 Allow staff and sales reps to place orders on behalf of customers. Export invoices, customers and products directly into your accounting software. Connect to Xero or Quickbooks Online. Ayten Gasson Lingerie are a Brighton based company specialising in silk lingerie trimmed with vintage and locally sourced English lace. Launched in 2005, they have become famed for a firm commitment to supporting the UK fashion industry. Ayten has been using OrderSpace since Spring 2012.